"If you think we're wax-works," he said, "you ought to pay, you know. Wax-works weren't made to be looked at for nothing2, nohow!" "You've begun wrong!" cried Tweedledum. "The first thing in a visit is to say 'How d'ye do?' and shake hands!" And here the two brothers gave each other a hug, and then they held out the two hands that were free, to shake hands with her. "But it certainly was funny," (Alice said afterwards, when she was telling her sister the history of all this,) "to find myself singing 'Here we go round the mulberry bush. '4 I don't know when I began it, but somehow I felt as if I'd been singing it a long long time!" Then they let go of Alice's hands, and stood looking at her for a minute: there was a rather awkward pause, as Alice didn't know how to begin a conversation with people she had just been dancing with. "It would never do to say 'How d'ye do?' now," she said to herself: "we seem to have got beyond that, somehow!" 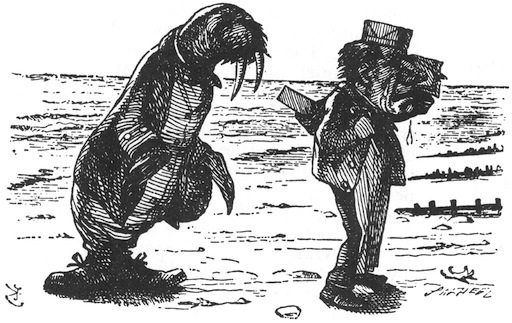 "'The Walrus And The Carpenter' is the longest," Tweedledum replied, giving his brother an affectionate hug. "The sun was shining "
Here Alice ventured to interrupt him. "If it's very long,' she said, as politely as she could, "would you please tell me first which road "
"That was mean!" Alice said indignantly. 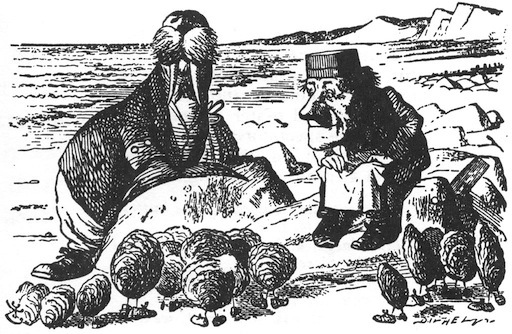 "Then I like the Carpenter best  if he didn't eat so many as the Walrus." This was a puzzler. After a pause, Alice began, "Well! They were both very unpleasant characters " Here she checked herself in some alarm, at hearing something that sounded to her like the puffing of a large steam-engine in the wood near them, though she feared it was more likely to be a wild beast. "Are there any lions or tigers about here?" she asked timidly. Alice couldn't say honestly that he was. He had a tall red night-cap13 on, with a tassel, and he was lying crumpled up into a sort of untidy heap, and snoring loud  "fit to snore his head off!" as Tweedledum remarked. "If I wasn't real," Alice said  half-laughing through her tears, it all seemed so ridiculous  "I shouldn't be able to cry." "I know they're talking nonsense," Alice thought to herself: "and it's foolish to cry about it." So she brushed away her tears, and went on, as cheerfully as she could. "At any rate I'd better be getting out of the wood, for really it's coming on very dark. Do you think it's going to rain?" Tweedledum spread a large umbrella18 over himself and his brother, and looked up into it. "No, I don't think it is," he said: "at least  not under here. Nohow." "It may  if it chooses," said Tweedledee: "we've no objection. Contrariwise." "It's only a rattle19," Alice said, after a careful examination of the little white thing. "Not a rattle-snake, you know," she added hastily, thinking that he was frightened: "only an old rattle  quite old and broken." "I knew it was!" cried Tweedledum, beginning to stamp about wildly and tear his hair. "It's spoilt, of course! "20 Here he looked at Tweedledee, who immediately sat down on the ground, and tried to hide himself under the umbrella. "But it isn't old!" Tweedledum cried, in a greater fury than ever. "It's new, I tell you  I bought it yesterday  my nice NEW RATTLE!!" and his voice rose to a perfect scream. All this time Tweedledee was trying his best to fold up the umbrella, with himself in it: which was such an extraordinary thing to do, that it quite took off Alice's attention from the angry brother. But he couldn't quite succeed, and it ended in his rolling over, bundled up in the umbrella, with only his head out: and there he lay, opening and shutting his mouth and his large eyes  "looking more like a fish than anything else," Alice thought. "I suppose so," the other sulkily replied21, as he crawled out of the umbrella: "only she must help us to dress up, you know." So the two brothers went off hand-in-hand into the wood, and returned in a minute with their arms full of things  such as bolsters22, blankets, hearth-rugs23, table-cloths, dish-covers and coal-scuttles24. "I hope you're a good hand at pinning and tying strings?" Tweedledum remarked. "Every one of these things has got to go on, somehow or other." Alice said afterwards she had never seen such a fuss made about anything in all her life  the way those two bustled about  and the quantity of things they put on  and the trouble they gave her in tying strings and fastening buttons  "Really they'll be more like bundles of old clothes than anything else, by the time they're ready!" she said to herself, as she arranged a bolster round the neck of Tweedledee, "to keep his head from being cut off," as he said. "You know," he added very gravely, "it's one of the most serious things that can possibly happen to one in a battle  to get one's head cut off." "Well  yes  a little," Alice replied gently. "Very well," the other said, rather sadly: "and she can watch us  only you'd better not come very close," he added: "I generally hit everything I can see  when I get really excited." "There's only one sword25, you know," Tweedledum said to his brother: "but you can have the umbrella  it's quite as sharp. Only we must begin quick. It's getting as dark as it can." "It's the crow26!" Tweedledum cried out in a shrill voice of alarm; and the two brothers took to their heels and were out of sight in a moment. Alice ran a little way into the wood, and stopped under a large tree. "It can never get at me here," she thought: "it's far too large to squeeze itself in among the trees. But I wish it wouldn't flap its wings so  it makes quite a hurricane in the wood  here's somebody's shawl being blown away!" Having commented on the origins of the names of these two characters already, it is worth pausing to consider the illustration a bit more closely. If you peer closely at the lines to the lower left, just in front of Alice's foot, you'll notice that they seem almost letter-like. On other illustrations this mark is much clearer, and it is in fact a stylized signature designating the Dalziel Brothers. According to the British Museum, they "ran the most important wood-engraving shop of the time." Illustrations were printed at this time by engraving the images onto wooden blocks, which were then inserted into the printing sets for the pages where they were to be printed. The carving was no small job, especially since the resultant blocks had to stand up to reuse for the hundreds and thousands of books printed. A second edition would not have lines as crisp as a first edition, and earlier numbers in an edition would have crisper lines than later ones. In fact, this is the key feature that led to first editions and earlier numbers being specially prized by book collectors and discerning book buyers. Digital printing has removed this issue to a significant degree, except in the area of colour printing, in which the quality of ink and alignment of the colour separations may change significantly between editions and numbers. Likely a reference to Madame Tussaud's, which had been established by its eponymous proprietor on Baker Street in 1835. There was certainly no seeing the wax works for free at the time, many of them being Madam Tussaud's own work, and their exhibition was how she made a living. Since the creation of the original museum, "Madam Tussaud's" has become a brand and there are franchises in several other countries. Lewis Carroll did not write this rhyme; it had been in the nursery rhyme repertoire for some time before he opted to feature it in this chapter. Officially there is some disagreement as to the origins of the rhyme, perhaps because there is a persistent reluctance to acknowledge that children do have their own body of lore that they pass among themselves. Remarkable as the idea may seem, it is far from unusual. In fact this phenomenon and children's willingness to experiment with language may even have contributed to the development of the Michif language in north america. Speaking of children's culture and lore, this song is one of many with roughly the same tune. One of these songs has become somewhat infamous: Ring Around the Rosie has been associated with some rather grim freight. On one hand "urban legend" argues that the song dates from the time when europe was being devastated by the plague, when among the final symptoms was a bout of sneezing or coughing before the victim fell dead. On the other, official folklorists argue that this must be impossible because the explanation is late, what the song describes doesn't sound much like the plague, and the words used to support the interpretation are themselves too late to really be related to the plague (see Wikipedia for a longer summary). The points against the plague interpretation by the folklorists are certainly reasonable. Yet it is also quite curious that this interpretation came up at all. Considering when it was first recorded in the written record by adults, in what appears to be around 1950, it seems quite possible that the plague interpretation is all about adult fears at that particular time. In fact, during the 1940s and 1950s, an especially terrible epidemic of poliomyelitis was striking children all over the world. Poliomyelitis doesn't involve sneezing and falling down either, but the key point is the connection with children who were the primary victims of the disease. Probably all of us have been involved in a conversation of this sort, where the person or persons we're speaking with are paying no real attention to what we're saying. This is generally quite harmless if irritating, but occasionally the results are unfortunate, especially if you are trying to order food in a restaurant. I have found it fascinating what wait-staff firmly believe I should have ordered versus what I actually asked for on several occasions. Since we have just learned that it was the middle of the night, when sea birds are not typically abroad. This is a fine piece of carrollian whimsy, but also thought-provoking once a person reads anything about the means the british navy used to recruit the lowest level sailors and somewhat higher level craftspeople. The lowest level sailors, the equivalent of a general, unskilled labourer on land, would often be sought out on the street or in pubs or other such places. They could be seized straightaway, or else plied with liquor and tall tales until they were too drunk to resist being hauled off to a ship. It is for this reason that you hear of sailors being "impressed"  that is, literally forced  into service, or "shangahi'd" a fate more common to sailors who were actually finished their terms of forced employment but were forced to ship out again. If you had a skill like carpentry, coopering, or cooking, you could be impressed into service more gently. But either way, the only people who arguably went to sea willingly were those in the officer stream. Prisoners could also be taken on ship to be transported as slave labour to the colonies, or even literally dumped on the shore of the "new world" and left to fend for themselves. On top of all this, ships did get sunk by weather or other misadventures. So the Walrus and the Carpenter are likely in difficult straits indeed. Nor coats to brush, for that matter. Oysters like to keep buried in the sand with the sea water washing over them, which both brings them food and washes away their wastes. To the chagrin of my english teachers in high school, this speech has always struck me as mock shakespearian in tone, mainly because the rhythm of the poem in general is built on iambic feet. A quick web search suggests that these are the typical accompaniments of raw oysters and cooked oysters alike. The reappearance of bread and butter as a staple part of the meal shows how fundamental it is in british food culture. The carpenter appears to be wearing a folded paper hat, a not uncommon practise among workers in wood and stone until quite recently. Such hats would not only be reasonably effective, they would be easy and cheap to make from yesterday's newspaper if need be, and thrown out when they became too dirty for further use. The trouble with using a cloth cap instead is simply that it could never be effectively cleaned, and such hats tend to become such foul things to wear that no sane person would willingly hang onto one. 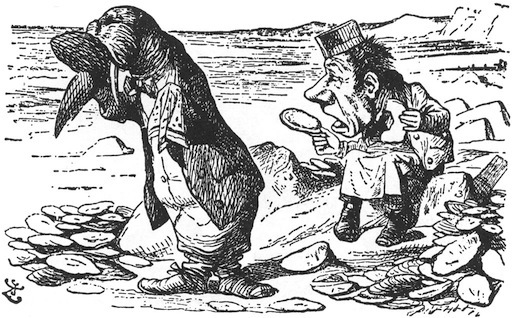 The idea that the Carpenter is a former ship's carpenter is plausible enough, and Tenniel's first illustration of him even seems to show a saw or similar peeking out of the Carpenter's duffel bag. But were there itinerant carpenters in his time? Well, yes and no. To become a carpenter in the first place, a boy (girls were blocked from such professions by social prejudice then) was expected to first apprentice for seven years. Then, he could become a journeyman, a carpenter who travelled from job to job gaining experience until he won a position in a larger shop, or was able to set up on his own. In the latter case, then he would be a master carpenter, and able to take on apprentices of his own. If we check back at the Chess Problem page, we would be quite justified in wondering how Alice couldn't have seen or heard the Red King sooner. 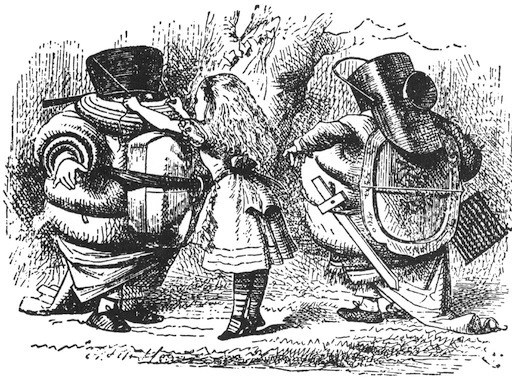 In a similar position on the board relative to the Red Queen, Alice found herself face to face with her. There is nothing in the information Lewis Carroll gives that suggests the Red King has recently moved to the square either, in fact both he and the White King are quite static, consistent with the range of moves they are able to make on the chess board. Night-caps are not often seen these days, although if you have access to a Lee Valley Tools catalogue you can purchase one very similar to this in white with blue stripes at any time. The reason they are less common now is simply that the rooms people sleep in are often quite warm. Before the days of central heating or if a bedroom was unequipped with its own fireplace, it could get quite cold after dark for most of the year. This is the ultimate reason for the practice of tucking a hot water bottle between the covers for awhile before going to bed, along with bed curtains, dressing gowns, and slippers. The black and white version of A Christmas Carol starring Alastair Sim gives an especially lovely view of the various defences against the cold in a Victorian era and earlier bedroom. Occasionally you can find writers claiming that women wore night-caps (interestingly, theirs were not pointy but round) in order to keep their elaborate hairdoes from being spoiled while they slept. Frankly, this idea is total crap. There is no way it would work unless the woman could somehow prevent herself from moving all night, and even then the likelihood of a night-cap working for that purpose is small. No, women used to wear night-caps for the same reason men did  to help them keep warm in a cool bedroom at night. In the instances where you see or hear of a woman wearing curlers with a night-cap to bed at night, what you are hearing is about a frugal woman endeavouring to achieve an overnight perm or maintain an expensive perm for longer. Which explains where the erroneous idea about all women's night-cap wearing comes from. Actually, it is unlikely that a steady snore would coincide with REM or dreaming sleep. According to the British Snoring and Sleep Apnoea Association, this is because the sleeper is breathing most shallowly at that time. The Red King is making quite a racket, but he does seem to be staying asleep, which he wouldn't if he was snoring during REM sleep as it is surprisingly easy to be woken by noise in that sort of sleep as well. Here Alice makes a critical mistake that Socrates' interlocutors made in every dialogue with him, according to Plato. Instead of challenging the unspoken and assumed premise, Alice has left it unchallenged, leaving her to become caught up in the deranged discussion with Tweedledee and Tweedledum that is about to ensue. Putting aside whether Alice could have successfully gotten into a real philosophical discussion, it is quite interesting how she winds up in this predicament, because as the Socratic example shows, it is by no means "little girl specific." Alice has already allowed several comments and presuppositions go by even though they are at best half-right because she is being polite and trying to stay focused on her objective. The politeness factor is a special conundrum here, because strange and school-boy-like as the Tweedles look, they are still in a stronger social position than Alice. Even if they were also children, Alice would still be a guest. Impolite behaviour towards a host is cross-culturally frowned on (though what counts as impolite is not). So Alice is in a realistic double-bind in the midst of an utter fantasy. Besides satirizing a socially awkward situation, I wonder if Carroll might have been satirizing Berkeleyan idealism as well. George Berkeley was an english philosopher and anglican priest. He is perhaps best known for his arguments against the idea that material things exist. His arguments are quite interesting whether or not a reader finds them persuasive: in effect he argues that material things can't be proved to exist in any way, because the only means we have for knowing about them are our senses. Since our senses can be fooled, and we have no way to prove that an object continues to exist as a material thing if no one perceives it, there can't be material things. Berkeley was understandably invested in this argument, because by means of it he can argue that their must be a god who does the overall perceiving so that everything we experience, including ourselves, exists. Yet I've always wondered if Berkeley wasn't having us all on in the end. After all, how can we rule out the idea that all of us together perceiving aren't god? Or that the individual perceiver is not in effect god while they are awake and perceiving? There seems to be a dangerously solipsistic strand in the whole argument in the end. Carroll might have shared this unease since he was both a logician and an anglican clergyman himself. In fact we can see this great umbrella laying on the ground behind the Tweedles in Tenniel's first illustration for the chapter. It has what looks almost like a parrot-head or walking-stick sort of handle. Umbrellas of this type seem to be a widely accepted emblem of britishness. They used to be quite common in the cities of Victoria and Vancouver in canada, where the rain is quite as persistent as in england itself, with the end result that many english colonists decided to stay there (a counter-intuitive choice to a person who dislikes rain). Having lived in both cities some years myself, I can vouch for the change in umbrella complement for the period I was there at least. Probably the strangest umbrella-related thing I encountered in Vancouver more recently was an umbrella vending machine at the international airport  not least because I had just walked past between four and seven shops selling  umbrellas. That is one seriously broken football rattle in Tenniel's illustration. 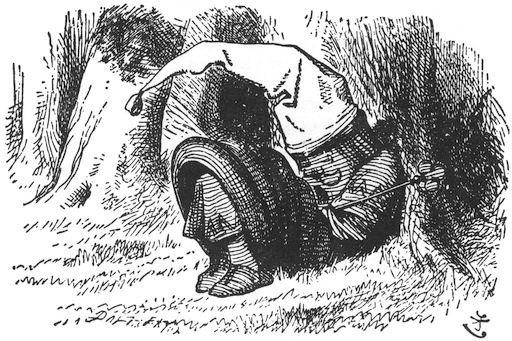 Considering the picture above in comparison to the broken rattle in the illustration, it is a bit easier to sympathize with Tweedledum at least a little. The Victorian School website comments with the football rattle picture suggests that in the Victorian era itself football rattles were probably not painted. 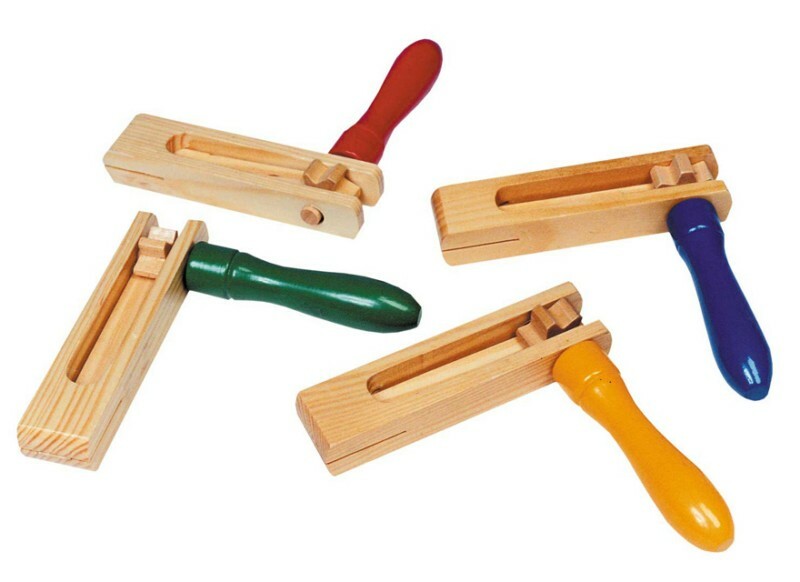 This may have been because such rattles could still be given to small children inclined to put their toys in their mouths, and paint was commonly lead-based. In any case, an unpainted rattle would easily get quite dirty and stained even if it was brand new. 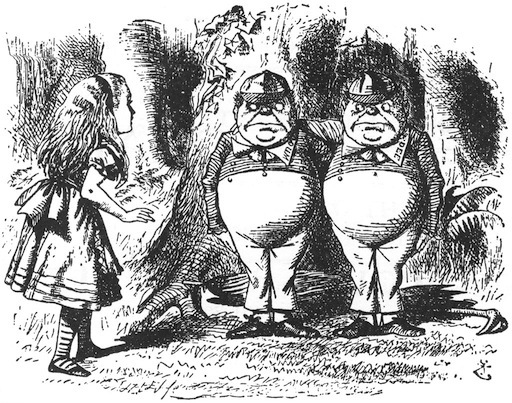 One of the Wikipedia writers on Tweedledum and Tweeldedee commented that the two brothers never directly contradict each other, even over the broken football rattle. This does seem to be true, since the only times they give arguably opposing statements, they aren't contradicting each other but giving two opposite statements to Alice. In fact, they only directly contradict her. A bolster is "a long, thick pillow placed under other pillows for support" according to my electronic OED. This is the sort of pillow that expensive hotel rooms should have, but never do. Perhaps Tweedledum has a bolster wrapped around him, giving him the "Michelin man" appearance he has in the illustration. A hearth-rug would be no trivial thing to tie onto a person or walk around in. They tend to be stiff and heavy due to the materials they are made of to keep them fire resistant and non-slip, as you wouldn't want someone to slip or trip over the hearth-rug as they walked by. A "coal-scuttle" is a fancy bucket for carrying and pouring coal into a stove. If that is what Tweedledee has on his head, he also has an important problem as he has no easy way to see out of it. For anyone who has watched Monty Python and the Holy Grail, the family resemblance between the coal-scuttle and the helmets worn by the various knights will be immediately evident. Carroll's coal scuttle helmet idea was either a commonplace or else it was taken up by another photographer, this one a professional, of the same time period, Julia Margaret Cameron, Virginia Woolf's great-aunt. My original reference for this is the Shakespeare Head Edition of 3 Guineas, which notes that Cameron had her husband wear a coal scuttle for a helmet in her photograph illustrations of Tennyson's The Idylls of the King. On further research, the British Library reveals that Tennyson himself requested the illustrations in 1874, three years after the publication of Through the Looking Glass, although the results were only published between 1859 and 1895. On looking through the photos, especially 13-16, it appears that Cameron both decorated the coal scuttle and the scuttle was rather elaborate in the first place. A different coal scuttle image is provided below courtesy of the Wikimedia Commons, just to bring out the variability more. 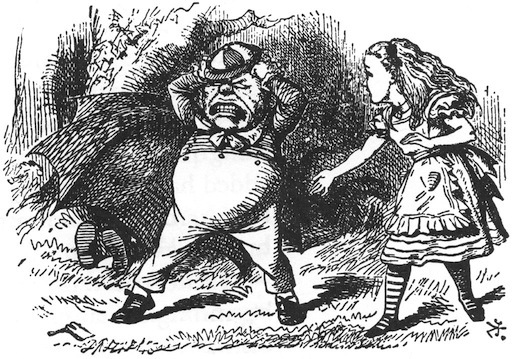 But notice that Tenniel has illustrated Tweedledee with the sword! It seems that both the hooded crow (black head and wings) and the carrion crow (all black) live in england. However, a monstrously large crow sounds more like a raven.